At Precision Garage Door Bay Area, we're proud to offer exceptional and affordable San Carlos garage door repair services ranging from door panel replacement to door track cleaning. Our shop is situated at 35 Quail Court, Suite 301, Walnut Creek, CA, 94596 and offers flexible appointment scheduling throughout the week. We'll resolve any issue associated with a noisy garage door and take care of the details of any San Carlos garage door repair job that you have. Call us at 1(866) 949 3722 today. Whether you need a garage door opener repair performed or broken springs replaced, our team is ready for the job. We'll do a thorough garage door safety inspection and educate you about any issues that we find. You can trust us to repair your broken or noisy garage door in a professional manner. Our goal is to take the stress out of any San Carlos garage door maintenance job. We can perform any door balance work, take care of a door track cleaning, or fix broken springs. We can work on any San Carlos garage doors and will stand behind our results. We charge reasonable rates for everything from door track repair work to cleaning services. You can have us perform a door balance so that your system functions smoothly and works for a long time. Getting a regular garage door safety inspection done can provide you with the peace of mind that nothing will go wrong. We pay close attention to details and will answer any of your questions honestly so that you can make informed decisions. 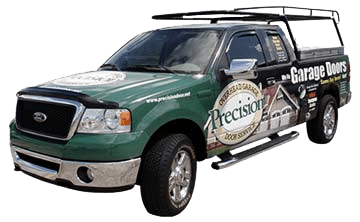 "We used Precision Door Service before and loved it! Cory came out and installed my garage door with ease. He was great, very courteous and friendly. We would use him again if we had a choice. Thank you Precision Door Services and thank you Cory for being an awesome tech. Keep it up!" 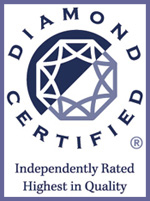 "I cannot say enough good things about the service that Mike has provided for me. My garage door started acting up by intermittently stopping half-way before closing. After fixing what we thought was the problem, he discovered that there was a short in the wiring that had to be replaced. He did the job, quickly and efficiently. 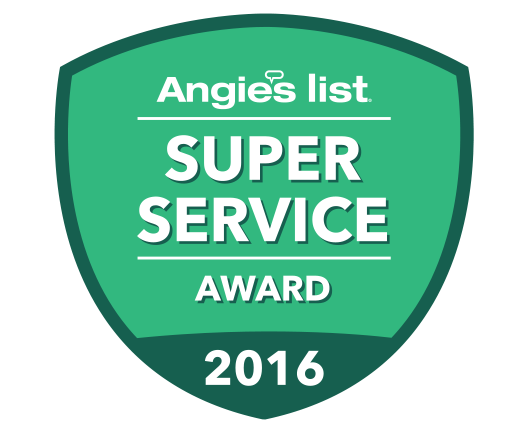 Should I have any type of problem in the future, I would not consider calling anybody else - PRECISION GARAGE DOOR and MIKE are the BEST!!!" "Paulino was great. He really knows garage doors and openers. Said he has been working on garage doors for 20 years. Good, hard working guy. I really liked him. He did a great job. Precision is lucky to have people like him." "Paulino is an excellent garage door mechanic. My door never worked better." "Malek was very helpful and fixed my issue. Thanks,"
"Tech was nice and explained everything, gave me options to repair garage. very professional." "Thank you for coming out so quickly. Excellent service!" "I am writing this on behalf of my husband, Joe. He was most pleased with the service by our repairman. I am sorry to say I don't know his name, but Joe said he was wonderful and gave him a five on the invoice or form. Joe and the repairman called me at work and asked for my email address so the repairman could email our invoice. He said it was on its way as we were talking, but it was never received. I called the office this morning and asked to have a copy of the invoice emailed as well as a copy of our December invoice, but haven't received them as yet. Perhaps you could help with that request. I also wanted to mention that Leah, the operator who answers the phone, is very cordial and helpful. We would like to get a copy of our invoices. Thank you so much for your help." "Fixed minor garage door problem Showed me how to watch garage safety sensor lights. Job well done." "Liked your ad in yellow pages. Thought I would leave a message, and was totally shocked to have a person answer. She was actually able to set up appt. within hours of my call --- this on a Sunday!! Doug arrived right on time, and explained the problem to me, and suggested what needed to be done, and finished the job in record time. Doug was efficient, friendly and professional! 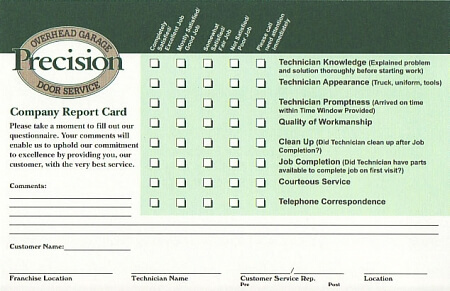 It was a very pleasant experience and I would recommend Precision Garage very highly!!!" "Definitely a 5-star recommendation. Their thoroughness is remarkable. I appreciated the follow-up; the technicians are very skilled and knowledgeable. We had a tiny glitch; they called and came back to make sue all was to our satisfaction. The owner is definitely concerned that everything must be perfect for the customer. Thanks!!!!!!" "Garage opener broke Monday night, called at what I thought was after hours to leave a message, yet my call was answered. An appointment was set for the next day and an email confirmation arrived within 5 minutes. Rick showed up on time, my garage now opens nearly silently, and he cleaned up with no trace he had been there. He gave us a breakdown for parts but no estimate per se, so we weren't quite sure waht to expect the total to be. The door sealing strip was quoted extra per foot. We OKed the 2 feet originally he estimated but the 2 feet became 10 feet of triple layers. We said no thanks at that point. It would have been helpful to have had an explanation of the lock feature on the wall opener mechanism. We have no idea what it is for as it didn't lock the garage door when we pushed it. I do like that the web site shows photos of their repairmen so you know who to expect."